Military Sealift Command's newest class of ships - Large, Medium-speed, Roll-on/Roll-off Ships, or LMSR - will significantly expand the nation's sealift capability in the 1990s and beyond. Nineteen LMSRs had been converted or built at U.S. shipyards by the year 2001. The LMSRs provide afloat prepositioning of an Army heavy brigade's equipment and a corps' combat support, as well as surge capability for lift of a heavy division's equipment from the United States. As wide and long as the FSS, the LMSRs carry almost twice the cargo because of the hull design and number of decks. Pedestal cranes and both side and stern ramps mean that the LMSR is ideally suited for undeveloped ports or logistics over the shore. MSC's Propositioning Program has 35 strategically located ships laden with military equipment, supplies and fuel for the U.S. Army, Air Force, Navy, Marine Corps and Defense Logistics Agency. Fifteen ships carry combat equipment and sustaining supplies for the U.S. Army, enough to sustain two Army heavy brigades -- up to 8,000 personnel -- for up to 30 days. Each Watson-class LMSR can carry an entire U.S. Army Armor Task Force including 58 tanks and 48 other tracked vehicles, plus more than 900 trucks and other wheeled vehicles. The Watson-class LMSRs, built by NASSCO, are 950-feet long, have a beam of 105 feet and are crewed by 30 merchant mariners. Each LMSR's huge, six-deck interior has a cargo carrying capacity of approximately 393,000 square feet, equivalent to greater than eight football fields. The ship's decks have ample open space for lashing down helicopters, tanks, trucks and other large vehicles. A slewing-stern ramp and a moveable side-port ramp make it easy to drive vehicles on and off the ship -- speeding loading and off-loading operations to just 96 hours total per ship. Two 110-ton single pedestal-twin cranes make it possible to load and unload cargo where shoreside infrastructure is limited or nonexistent. The need for additional military sealift ships was identified in a Congressionally-mandated study by the Joint Chiefs of Staff in the early 1990s. The Mobility Requirements Study focused on Department of Defense transportation during the Persian Gulf War. It highlighted the urgent need for greater sealift capacity to transport military equipment and supplies during wartime and other national contingencies. In response to the sealift shortfall, an ambitious Strategic Sealift Acquisition Program was introduced. Plans called for adding 19 LMSRs which will provide five million square feet of capacity early in the next century. The LMSR program currently has 19 ships, 5 of which were initially conversions of existing commercial container vessels to replace the existing fleet of seven RO/ROs, and 14 of which were newly constructed ships. 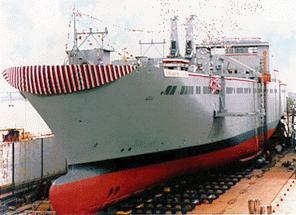 In FY 98, three newly constructed LMSRs joined the fleet, followed by four more in FY 99-02. At that time, the five converted LMSRs were removed from service. All 19 ships use common cargo handling systems, procured by the Navy. LMSRs are being built by three contractors. A performance type procurement description was used, therefore specific ship configurations differ as the respective builders interpret the mission requirements. The ship carries vehicles and equipment to support humanitarian missions, as well as combat missions. The new construction vessels have a cargo carrying capacity of more than 380,000 square feet, equivalent to almost eight football fields. In addition, LMSRs have a slewing stern ramp and a removable ramp which services two side ports making it easy to drive vehicles on and off the ship. Interior ramps between decks ease traffic flow once cargo is loaded aboard ship. Two 110-ton single pedestal twin cranes make it possible to load and unload cargo where shoreside infrastructure is limited or nonexistent. A commercial helicopter deck was added for emergency, daytime landing. The LMSR ships are Large (950 feet long, 106 feet wide, 55,000 long ton displacement), Medium Speed (24 knots), Roll-on/Roll-off (RO/RO) vessels. The sealift ships are capable of self-sustained RO/RO and Lift on/Lift off (LO/LO) operations at a pier and in a Logistics-Over-the Shore (LOTS) scenario through stern and side port ramps to a RO/RO Discharge Facility (RRDF). In addition, the LMSR is capable of self-sustained LO/LO cargo operations in a LOTS scenario by interfacing with lighterage. The LMSR ships are not armed, and do not have a combat system. They do have C3I suite sufficient to perform their intended mission in conjunction with other Naval vessels. USNS Bob Hope is the lead ship in the new Bob Hope class of sealift ships being built by Avondale Industries. The contract for the lead ship was awarded in September 1993 and called for one ship at a cost of $265 million and included options for up to five additional ships at a total cost of $1.3 billion. On 27 May 1997 Avondale Industries announced that it was awarded a new option for the construction of the seventh ship in the Bob Hope class. The option has a value of $228.2 million upon its exercise which is anticipated in 1999. After consideration of certain additional components and cost escalations, the option when exercised is expected to total more than $250 million. Avondale's peak production on the Sealift vessels is anticipated to involve the direct employment by the company of approximately 3,000 individuals. In addition to the Bob Hope class ships, contracts for the Watson class sealift ships were awarded in 1993 including a $1.3 billion contract to the National Steel and Shipbuilding Company (NASSCO) for one new construction ship plus an option for up to five additional ships, a $426 million contract to Newport News Shipyard for two converted ships and a $635 million contract to NASSCO for three converted ships. On 28 May 1997 National Steel and Shipbuilding Company (NASSCO) received a $227 million Navy contract to build a sixth strategic Sealift ship. And on 14 November 1997 NASSCO announced that the company had been awarded a $195 million contract for the construction of the seventh Strategic Sealift Ship. Initially it appeared that a total of 14 ships of this class would be constructed, equally divided between NASSCO and Avondale. However, the class consists of at least 15 ships, with the addition of TAKR 317, to be delivered in October 2002. The Soderman was originally converted by NASSCO from a commercial containership to a large, medium-speed, roll-on/roll-off (LMSR) vessel and delivered to the Navy in November 1997. Funding for construction of a new LMSR to replace the Soderman in the Navy's combat prepositioning squadron of LMSRs was included in the FY-2001 Defense Appropriations bill approved by Congress in October 1999. On 16 January 2001 T-AKR 299 Soderman was redesignated STOCKHAM (T-AKR 299). The name "Soderman" was re-assigned to T-AKR 317. After some 90 days of sustained aerial bombing, the Serbs agreed to evacuate Kosovo and the air war came to an end. The need to move a peacekeeping force into Kosovo propelled MTMC and its maritime partner, the Navy's Military Sealift Command, into action. The Bob Hope arrived in Thessaloniki on 29 June 1999, 6 days after departing Bremerhaven. The 949-foot ship-almost the size of one of the Navy's Nimitz-class aircraft carriers-brought 1,345 individual pieces of equipment, including 119 shipping containers. It was the first major deployment for the newly commissioned roll-on-roll-off ship, which was named after the comedian who entertained U.S. servicemembers around the world for 50 years. The Bob Hope completed discharge of its cargo on 1 July. The Soderman arrived 3 July, and its unloading began at once. With all personnel hustling, the ship cargoes were received, staged, and prepared for onward movement. MTMC transporters received enormous unloading assistance from soldiers and civilians of the 29th Support Group from Kaiserslautern, Germany; local contractors; and the port authority. The support group numbered approximately 170 personnel at its peak. Most of the equipment was driven off the ship by 1st Infantry Division drivers. Troops from other NATO nations were present as well. Many of the heavy equipment transporters at the port were from the British and French armies. The US Navy's Military Sealift Command ship USNS Bob Hope completed its Balkan operation in early July 1999, moving heavy combat equipment and supplies to U.S. peacekeeping forces in Kosovo. Following Joint Guardian operations, Bob Hope was loaded with Army combat equipment and prepositioned off Diego Garcia in the Indian Ocean. Eleven LMSRs, delivered by the end of FY 2001, are maintained in a 4-day Reduced Operating Status (ROS-4) as recommended by the OSD published Requirements Study (MRS) and the MRS Bottom-Up Review Update (MRS BURU). These ships provide the initial surge sealift Mobility Requirements Study (MRS) and the MRS Bottom-Up Review Update (MRS BURU). These ships provide the initial capacity required transport the lead combat forces from CONUS to a given area of operations and satisfy time critical warfighting surge sealift capacity required to transport the lead combat forces from CONUS to a given area of operations. The criteria for each readiness status was also specified in the MRS (i.e. Outporting, Sea/Dock Trials, critical warfighting requirements. The criteria for each readiness status was also specified in the MRS (i.e. Outporting, Maintenance). ROS-4 ships have a cadre crew assigned, outported at a layberth, and undergo annual sea trials, periodic dock Sea/Dock Trials, Maintenance). ROS-4 ships have a cadre crew assigned, outported at a layberth, and undergo annual sea trials, and required periodic regulatory drydockings/inspections.trials, periodic dock trials, and required periodic regulatory drydockings/inspections. Cost data incrementally increases as ships are delivered to the fleet and undergo an initial post delivery crew familarization/warranty maintenance period. On 05 August 2002, Military Sealift Command awarded Maersk Line, Limited, of Norfolk, Va., a five-year contract that could total $400 million to operate and maintain eight large, medium-speed, roll-on/roll-off ships that strategically preposition Army equipment in the Indian Ocean near Diego Garcia. The eight LMSRs covered under the contract -- USNS Watson, USNS Watkins, USNS Red Cloud, USNS Sisler, USNS Soderman, USNS Charlton, USNS Dahl and USNS Pomeroy -- carry 33 percent of all prepositioned Army equipment. Two of the U.S. Navy's largest noncombatant ships loaded Army combat equipment in Jacksonville, Fla., on February 11, 2003. USNS Dahl and USNS Bob Hope - large, medium-speed, roll-on/roll-off ships - loaded military cargo for the 101st Airborne Division, Fort Campbell, Ky., as part of the repositioning of U.S. forces in support of the president's global war on terrorism. Cargo included Army Blackhawk, Apache, Kiowa and Chinnook helicopters and a variety of wheeled vehicles. The Military Sealift Command deployed LMSR ships extensively for transport of Army equipment to support operations against Iraq in 2003. The performance of the ships in these actual operations provides additional support for the conclusions as to their effectiveness and suitability.